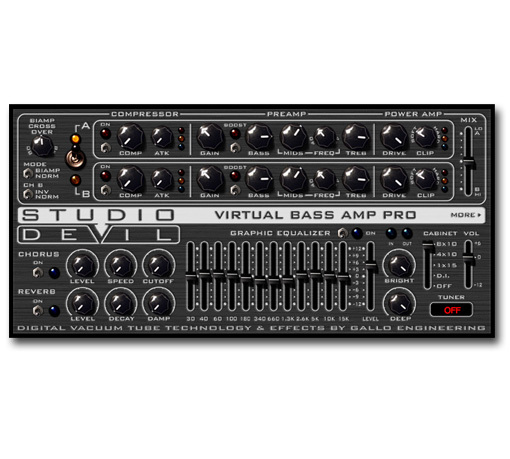 Studio Devil Virtual Bass Amp Pro is a bass amp modeling and audio effects plug-in for use with VST, AudioUnits, and ProTools RTAS compatible hosts running on both Mac and Windows platforms. 2 Discrete Channels each with independent compressor, gain, tone, and limiter controls modeled using Studio Devil’s patented digital vacuum tube modeling technology! A/B Switch and MIX Control to switch between channels or blend both channels together! Bi-Amp Mode with tunable crossover lets you send lows to one channel, highs to the other, and then process and mix them independently! Tube Preamp Controls: Dual tube preamps with Gain, Boost, Bass, Tunable Mids, and Treble controls that interact with your tone just like on real tube amps! Power Amp Limiters: Dual power amp limiters with Drive and Variable Clipping controls! Channel B Phase Switch lets you add or subtract harmonics and tone from your mix! 5 Cabinet Emulation Modes: 8x10, 4x10, 1x15, DI Emulator, and Bypass Modes featuring cabinet models from the Red Wire Impulses® collection! 12-Band Graphic EQ for precision tone sculpting! 2 Studio Quality Effects: Custom Bass Chorus and World-Class Reverb! Built-In Chromatic Tuner to stay in tune. Import and Export Presets via XML files to share your tones with everyone via the Internet, email, and blogs! Requires a 32 or 64-bit VST, Audio Units, or RTAS audio host for Windows or Mac OS X.